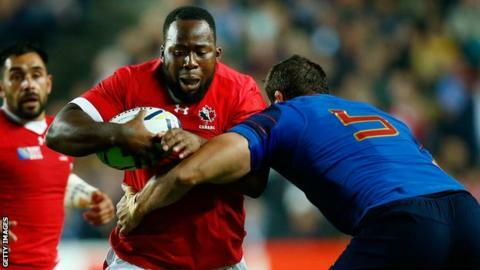 Canada international Djustice Sears-Duru has signed a contract with Glasgow Warriors until the end of the season. The 21-year-old loose-head prop played in the World Cup last year - and also against the Warriors in a pre-season match in Nova Scotia last August. He has been training with the squad since arriving in Glasgow on Sunday. "I talked to DTH [van der Merwe], Connor [Braid] and Taylor [Paris] and they all had good things to say about the club," said Sears-Duru. "Glasgow play a really good style of rugby and I'm glad to be part of it. "I'm still young, so hopefully I can learn a lot here and become a better player and continue to play for Canada and do well for Glasgow."